This segment focuses on a person or people. It captures and shares the person’s likeness, expression, personal experience and emotions. The face and expression are often the primary focus. Common subjects are significant, memory-rich experiences such as weddings, anniversaries, graduations, religious milestones and family development. Other images celebrate holidays, corporate achievement, school progression, sports team participation and organizational involvement. “We have been in business for 16 years, offering our customers processing and printing of conventional film on most popular formats, in sizes from 4×6 to 8×10. We also offer picture ids, photo restoration, picture templates for kids, school packages, photo frames, calendars, and many other items. But we could never do prints over 12×18 inches. Everything was done on Fuji Frontiers. 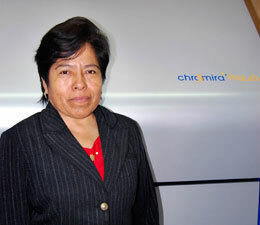 We saw the Chromira ProLab demonstrated at COMFOT in Mexico City and realized that, with its large-format printing and speed, special sizes can be made really easily. Now, we can make large-format prints from 20×30 to 30×40 and also any special sizes that our customers request. We chose the ProLab for its functionality, quality, speed, and versatility. Also, it has a small footprint, low maintenance, and is easy to calibrate. Working with the Chromira ProLab has a lot of benefits for me and also for my customers, because it has a good working speed and very high quality. For that reason, I obtain good productivity. “To me, the decision to purchase was a no brainer. I had done my homework and calculated that I could reduce my labor expense by two employees and I knew the continuous cutting, sorting, and order assembly would really speed up my in-house turnaround time. Now, after only 12 months, my business and profitability have actually changed more than I would have imagined. Now I have an even workflow with none of the production bottlenecks I used to have. That means virtually no overtime, totally predictable production scheduling, and flexible production capability even in our Peak Season. Reduced paper waste was a real plus. Since all print sizes are imaged from one 30? roll every print is always a perfect match. This is huge! I never have redo?s because of size matching. Even if I am making a wallet and a 30×40 from the same image, they are perfect matches. And the print nesting features eliminate most of the waste. Labor Savings; the reality was a big surprise. While I expected to cut my production labor expense, what has actually happened is my production labor has reduced to the point where one person does what it took three people to do?.and the one person does it faster and better. And the smoother workflow since we got the ProLab has allowed my print finishing staff to handle more work. 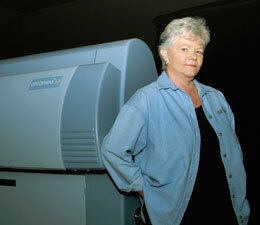 The ProLab gives me very fast turnaround times and allows me to bring in new customers without increased overhead. My former 2-3 day production order workflow used to take 12-14 hours for a normal cycle and now our standard turnaround for printing is less than 90 minutes. But I can very easily produce a completed order in 15 minutes whenever needed?without a lot of paper waste. But I think that I was most surprised to find that we are saving over $300 per month in our cost of utilities: water, electricity, heating and cooling over our historical costs because the machine is so efficient and runs so cool. As for quality, our Chromira printers have always given us the color, resolution and consistent quality we needed for our most discriminating customers but we now see much more neutral and consistent B&W portraits on color paper. On Throughput: “We began to realize while we were still using the 1x that we had workflow bottlenecks (7-hour print times, 1-hour paper processing, 4-6 hours trim and sort per roll, short or damaged prints, interruptions for rushes) that caused us to have a 2-day order turn, at best. Workflow was not smooth. Prints were finished in big (roll size) batches and we had people sitting around waiting to check, mount, spray, etc., prints and when they finished, they waited for the next batch. There was a lot of unproductive down time. Of course, my experience relates to the Chromira 1x and labs that used several digital printers had slightly fewer bottlenecks, perhaps. Our competition was shipping same day and even though in most cases it wasn’t really necessary for the customer, it was a point of difference between the competitor and us. But we could do nothing about it with that equipment and workflow. “In 2005, we had a Lucht printer (analog). Then, we saw the digital age coming at us like a freight train. So, we bought a Chromira. 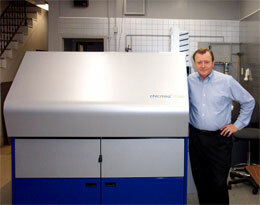 We chose Chromira because we didn’t want to be limited by using a one hour lab like the Fuji Frontiers or Noritsus. We also didn’t want to get an inkjet printer for larger prints and try to match them up. We wanted to be able to print small and large prints on the same paper. Also, ZBE was highly recommended by someone that I had worked with for years, so they had a good reputation to begin with.